Nobody does promotional photo calls quite like Sacha Baron Cohen. He started the morning on an offshore yacht, where he frolicked with a young lady overlooked by armed guards, until his pneumatic female companion (supermodel Elisabetta Canalis) overstepped the mark and had to be disposed of. 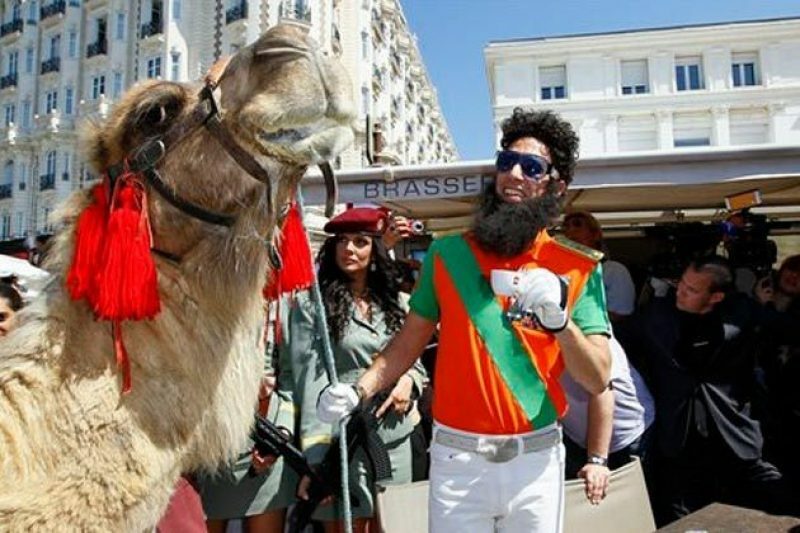 At 10:30, he showed up on the steps of the landmark Carlton Hotel in the summer sunshine, riding a camel and accompanied by an entourage of fetching armed guards. Funny, I was just thinking of that outrageous luminous swimsuit he wore at Cannes for Borat – he certainly knows how to stir up the media!